Zoot-suit and flapper-costumed National Press Club members and their guests packed into the Truman Lounge and Reliable Source as the Club was turned into a 1920’s-era Speakeasy Oct. 3. Shades were drawn, lights dimmed, and doors shut tight to prevent the “prohis” from detecting a strong and sultry performance of jazz-era standards by The Maureen Mullaney quintet, or the secret members-only poker game that was played in the Game Room. The Club’s Events Committee presented the event in honor of NPC Luncheon Speaker Ken Burns’s newest documentary, “Prohibition”, which premiered recently on PBS. --  Gayela Bynum: Bynum served on the NPC Board of Governors from 2001 to 2009, as a program manager for HUD’s Center for Faith-Based and Neighborhood Partnerships, and as the founder of a nonprofit organization, “We Will Survive Cancer." The judges bestowed the honor of “Flirtiest Flapper” to Donna Borak, “Best Zoot Suit” to Club Treasurer Myron Belkind, and “Great Gatsby Group” to Stone Lyons and Thomas Sanchez, vice chairman of the communications & marketing committee. Winners received gift certificates to The Fourth Estate. 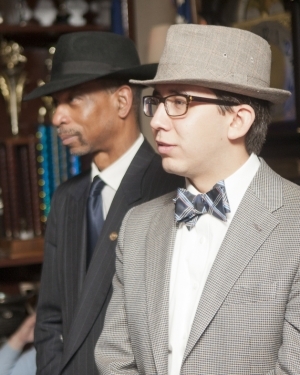 Speakeasy guests also participated in a trivia contest that challenged players about their knowledge of local Prohibition-era facts. The trivia questions were created by member Marc Wojno, senior associate editor for research at Kiplinger Washington Editors, Inc.
Mark Sherman, was the only competitor to get 9 out of 10 questions correct. For those who could not attend the event, test your Prohibition knowledge with the trivia quiz below. Click here to check your answers. 1. What date did the 18th Amendment proclaiming Prohibition, take effect? 2. About how many speakeasies were in Washington, D.C., during Prohibition? 3. Which U.S. president wanted to make Washington, D.C., a model “dry” city? 4. President Warren G. Harding served hard liquor in the White House private quarters during which type of game? 5. What distinction did the National Press Club receive upon the signing of the 21st Amendment ending Prohibition? a. It was granted the first liquor license (#1) in Washington, D.C.
6. Where was D.C.’s signature cocktail, the Ricky, invented? 7. Which state was the first to pass the repeal of Prohibition in 1933? 8. Wayne Wheeler was the head of this lobbying group, which was mainly responsible for the passage of Prohibition? 9. George Cassiday, a man who became famous for supplying alcoholic beverages to members of Congress during Prohibition, was better known by which nickname below? 10. During Prohibition, how much alcohol could legally be in a beverage? d.  0 – Dude, it was freakin’ Pro-hi-bi-tion!